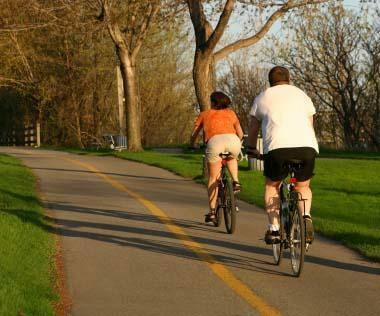 Challenge your partner to a bike ride! The Fitness Challenge board game can help you lose weight! It's designed to challenge adults to work on their exercise and fitness goals for eight weeks while they compete with a partner who is also trying to work on their individual goals. The game was developed in 1998 by Vicki Sorensen as a way to motivate herself and her fiancé Scott to lose some weight before their wedding day. Vicki thought that she and Scott might not have the motivation to keep up a regular work-out program. So she developed a point system and rewards to motivate them to exercise at least three days a week for eight weeks. The game gave Vicki and Scott the motivation they needed. On the day of their wedding, Scott had lost 20 pounds and Vicki was down to a size six. Vicki also used the game to lose the 60 pounds she had gained with the pregnancies of her two children. This time she played the game with her mom, Stephanie, who wanted to get back into shape after having spent five months on crutches with a broken leg. Both were able to get back into shape using the game. Vicki and Stephanie shared the game with friends and neighbors who wanted to get into shape. Based on their results and the fun that everyone was having using the game, they decided to make the game available to the public. Sales of the Fitness Challenge board game benefit groups that promote health and wellness, medical research and children's and family issues. One dollar from the sale of every game goes into the Fitness Challenge Foundation, Inc., a non-profit organization whose mission is to support these types of charities and community organizations. You can play the game regardless of your fitness level. You can be just starting out with a fitness routine or you can already have an established exercise program. Start by selecting a partner to challenge. The partner could be your spouse, co-worker, neighbor, relative or friend. The two of you will have a friendly competition, challenging each other to lose weight and get fit. Each player establishes the exercise program he or she wants to follow. The game has a point system that is designed to motivate you to exercise at least three days a week, every week for eight weeks. You select the days, the number of hours and the type of exercise. You have a wide variety of exercise options, from walking to weight training to biking to mountain climbing. The game tells you how long you have to do each exercise to get the full fitness result. Each player posts his progress on the scorecard. Players earn stars and fun "mini prizes" as they achieve their program goals. You and your partner can compete each week for "mini prizes." Both of you pick one of the wagering coupons. The person who is ahead at the end of the week gets the "mini prize" noted on the wagering coupon which they have selected. Compete for four workouts each week instead of three. Save the 3-point star for that fourth workout. You can modify the exercise list to meet your needs. One of the founders played the game with a broken leg, so she earned her stars by doing 30 minutes of floor leg lifts. You can decide to combine two activities from the exercise list such as walking AND weight training. You can compete for four weeks instead of eight. The winning player is the one to complete their exercise program and earn more points than the other player. If exercising is boring and you need a motivational boost, this game is for you. Maybe all you need is a little old-fashioned competition from someone who wants to stay on their exercise program as much as you do. Consider giving this as a gift to your potential partner! It's a great way to say "Let's meet this challenge together."